Code2Action is making a BIG SPLASH at this weeks 2013 IBEX SHOW with Dolphinite’s Innovation Award Winning Product GelMatch™, the All-In-One Gelcoat Aerosol Can for the marine industry. 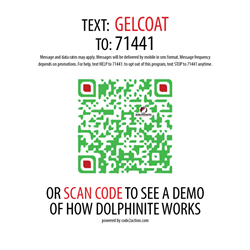 The 2012 IBEX Innovation Award Winner, Dolphinite’s GelMatch™ All-In-One Gelcoat Aerosol Can is making a big splash at this weeks 2013 event by utilizing Code2Action's proprietary mobile media platform. The new “How-to Video” brings it to life through product demonstrations and video instructions. With video content dominating the marketplace Code2Action is providing a new way in which companies showcase their products. Code2Action has extensive experience in creating audio/video messages and has seen the benefit companies have received by choosing to use video paired with mobile media. This is a unique way to showcase the product content but the medium in which it is delivered is more reachable to the consumer. Code2Action subscribers can create branded Audio/Video campaigns with relevant keywords to engage customers while capturing mobile data. A simple scan or text message puts the product demonstration in the consumers hand to engage in real-time. The captured data will allow the company to reach back out to the consumer with future offers or information about new or existing products. The new Dolphinite GelMatch™ All-In-One Gelcoat Aerosol Can is an innovative product that solves the traditional challenges when repairing gelcoat. Most repairs are costly and time consuming, so mistakes in mixing and color matching can be very expensive. Dolphinite’s GelMatch All-In-One Gelcoat Aerosol Can takes the guess out of these problems, providing an aerosol can that is pre-filled with a proprietary All-In-One Gelcoat and matched perfectly to original factory colors. "Our goal is to make the purchase process as seamless as possible for Dolphinite and Code2Action plays a key role in accelerating that transaction," says Scott Milbury, President of Code2action. "By enabling customers to easily scan or text a keyword on the label with their mobile phone, we visually demonstrate the product with video audio instructions making it more comfortable for the consumer to understand how the product is used before they buy it." Code2Action has empowered business owners to be in control of managing their company’s mobile and media marketing advertising. By delivering repeat exposure without spamming your customers, they create brand awareness for their company with increased response rates & ROI while maintaining a very reasonable marketing budget. 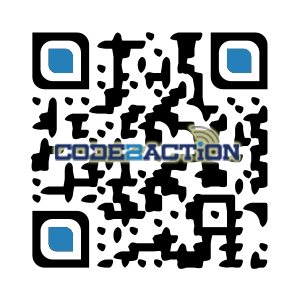 About Code 2 Action, Inc.
C2A a subscription based, in the cloud, mobile mobile marketing Company that has developed a proprietary mobile media platform providing businesses with the marketing tools and media services to create branded Audio/Video and dynamic mobile marketing solutions. Founded in 2012, the Massachusetts-based firm brings mobile marketing opportunities to entrepreneurs by removing the high cost normally associated with the technological expertise. Using Code2Actions proprietary software and innovative all-in-one marketing solutions, small to large business operators are able to develop, distribute, and analyze mobile and video marketing campaigns. More information is available through http://www.code2action.com or simply text # 71441 and in the message box enter C2A and send.